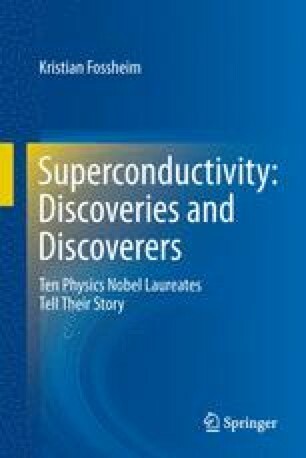 Leon N. Cooper shared the Nobel Prize in Physics 1972 with John Bardeen and John Robert Schrieffer “for their jointly developed theory of superconductivity, usually called the BCS-theory.” The famous BCS-theory stands out as one of the major achievements in all of science in the 20th century. Winning the race for a theory of superconductivity has been compared to the race towards the discovery of DNA by Watson and Crick in 1953. Superconductivity was referred to sometimes as “the holy grail.” It was, according to Phil Anderson, “where all the big guys wanted to be.” One who was there already was John Bardeen who came to share the Nobel Prize for research on semiconductors and the transistor effect in 1956. From 1955 he would organize the final, successful effort to understand superconductivity.